You asked for them, and we're bringing them back! By popular demand, the Torment exclusive backer poster add-on has returned! This stunning poster will feature a design to match the one we did for Wasteland 2. Also like our Wasteland 2 poster, this one will include a list of backer names integrated into the artwork in order to celebrate those who are helping to make Torment possible. As an added bonus, the Torment poster includes free shipping for anyone in the USA, as well as those worldwide with a total pledge level of $70 (7,000 points) or more on their Torment backer account. To add the poster to your rewards, just login to your Torment backer account, visit the Shop page, and add it to your account like any other add-on. 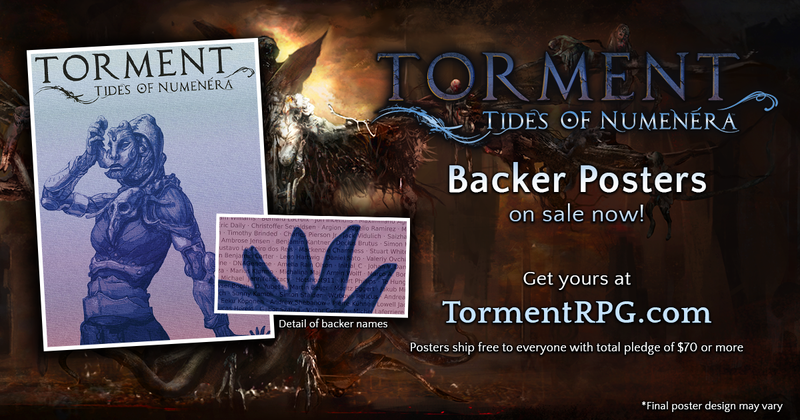 Re: Torment backer posters available again! sear wrote: You asked for them, and we're bringing them back! By popular demand, the Torment exclusive backer poster add-on has returned! This stunning poster will feature a design to match the one we did for Wasteland 2. Also like our Wasteland 2 poster, this one will include a list of backer names integrated into the artwork in order to celebrate those who are helping to make Torment possible. Till when will we be able to pledge for these ones? Oh, and another question as well: Will these ship folded or rolled? The Wasteland 2 poster shipped rolled up in a tube; we'll probably use the same process. tonurics wrote: The Wasteland 2 poster shipped rolled up in a tube; we'll probably use the same process. I hope so, just pledged for it! I'm a little confused: I did the 495 $ mega pledge but the item is not under my unlockables. Do I have to buy it? I thought not, considering: "As an added bonus, the Torment poster includes free shipping for anyone in the USA, and everyone worldwide with total pledge level of $70 or above." Or does this concern only the shipping itself and not the poster? The shipping is free in your case, not the poster itself. Sorry for any confusion. 35 Dollars (including shipping) for one single poster?! That is a tad expensive... maybe I'm just spoiled by CIG and Star Citizen, but they give out high quality and even truly limited posters for free, including free shipping. I have three of those, two of which are limited to 1500 pieces in total, of which one has been signed and personalized for me by the whole Customer Service Team, and another one which isn't limited but signed by nearly the whole Foundry 42 UK developer team - and all of them were gifts, sent to me from England to Germany free of charge. Now I'm not saying you should give those posters away for free as well, I'm fully aware that your funds aren't as excessive as CIG's, but still... 25 bucks excluding shipping for one single poster seems too much, given that you can pick up the entire game for about the same amount. Hi guys. This is great news. Tides of Numenera is my first ever backed KS project so I'm really excited for this poster! Does anyone know if there is a list of all official backers for this game? I'm curious to see if my name comes up. Does that mean we can expect to see the poster riddled with terrible email account names like: MrLovemachine or abcdefghijklmnopqrstuvwxyz or anonymous6059? Will you be using the "name for credits" or the "full name" field? The source data will comes from the "name for credits" field, but we might apply additional formatting or use stricter filtering requirements (basically, don't write something obnoxious; best to stick with your name). You can check out the WL2 poster search to get an idea of what to expect. tonurics wrote: The source data will comes from the "name for credits" field, but we might apply additional formatting or use stricter filtering requirements (basically, don't write something obnoxious; best to stick with your name). You can check out the WL2 poster search to get an idea of what to expect.